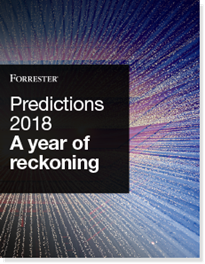 2018 will force businesses to take action or risk falling behind. Many factors are combining to determine the fate of companies, including the impending enforcement of the General Data Protection Regulation. As companies consider the impact of full, partial, or non-compliance, they will be weighing the costs and risks associated with each option. Most companies will take the side of risk; but at what cost to their brand? Discover 13 key market dynamics that will shape the year ahead for your team and your business. ©, Forrester Research, Inc. and/or its subsidiaries. All rights reserved.